This Valentine's Day, meet the couple who got their purrfect happy ever after, when their mutual love for felines caused them to fall head-over-heels in love. 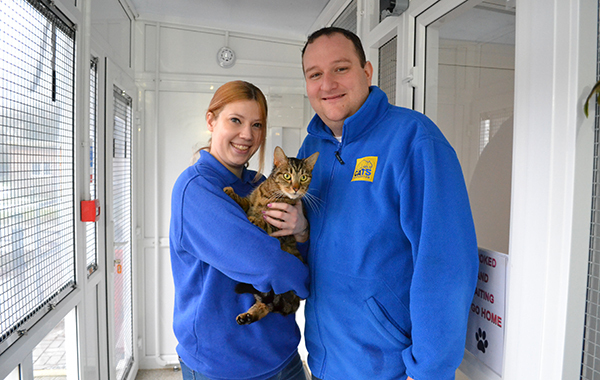 Jade King (31) is deputy manager at Cats Protection’s Bredhurst Adoption Centre, and met her husband Andrew (33) when she undertook some work experience at the centre in November 2005. Andrew was already working there as a cat care assistant at that time. The following year Jade also became a full-time cat care assistant, and the pair soon struck up a friendship, fuelled by their mutual love of animals, particularly cats, and started spending time together outside of work. They started dating by the beginning of 2008, and in September that year they bought their first house together. They got engaged soon after, and were married on June 16, 2010. On April 1, 2011 they welcomed daughter Tayla to their family, and they currently have four cats, all from Cats Protection.